Fancy yourself a bit of a Jamie Oliver in the kitchen? Maybe a little Nigella Lawson? If not, don’t despair- because Chef’N products can turn anyone into a star chef! Start by getting the basics right with this mini magnetic set of salt and pepper grinders- designed to help busy cooks season, simmer and stir all at the same time! 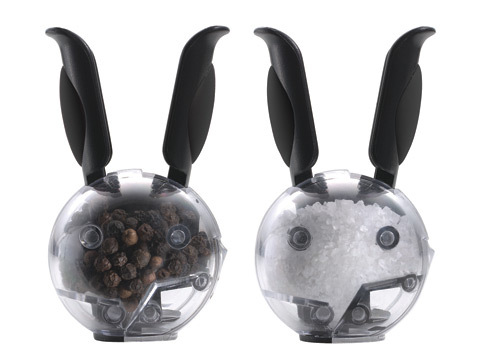 They’re so easy to use- simply fill the chambers with your choice of sea salt and peppercorns, then give the one-handed grinders a squeeze to sprinkle your pepper and salt into a pot, pan or platter. Fastened with mini magnets for easy storage, these clever little containers will help you give Gordon Ramsay a run for his money! Each Grinder comes filled with either fresh sea salt or peppercorns. Easy to re-fill- just lift the plastic doors on either side. Fastened with mini magnets- for easy storage on the fridge door. Presented as set of two in a clear plastic box.